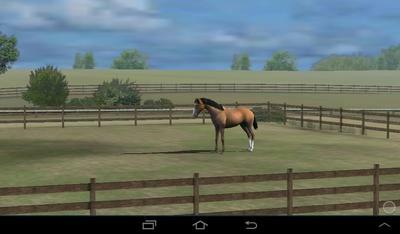 My Horse is a fun interactive free game for the tablet. 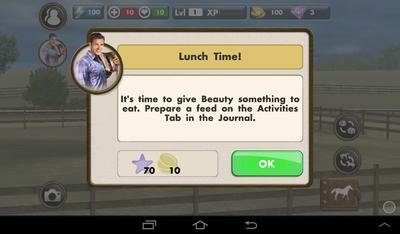 In this game you have tasks to complete in order to gain money and gems. You can also groom your horse, compete with it, train it, and feed it. It is based on English riding and you get to jump. You also get to clean the paddock and muck the stall (how fun)! One other fun aspect of the game is the shopping. Not only do you get to shop for riding outfits but you also get to shop for tack for your horse. The graphics are some of the best I have seen as far as free online games go. Overall, this fun interactive game is a lot of fun. Once you do, be sure to come back, review it and share your tips in the comments below! I adore this game! It is so awesome! I love the game but why can't you start with every horse and not have limited energy? I'm on the very last comp and its really hard and on horse heaven I have almost every horse. I'm a level 74 and I've been on for almost three years I get on every day until my tablet dies. I have this game, it is great!!! If anyone needs help I would be happy to give tips and answer questions for ya'll. It's a great game! Only problem is too many ads. Has anyone been on this game long enough to know what tack to buy without wasting money? For example, as you progress, competitions require tack with specific gems, or "better tack." I want to focus on buying tack that will give me the biggest bang for my buck. And I forgot to tell you my nickname is FirstChampion. I have nine horses and am on level 50. I also finished the UK open championships and working on the US World Series and Kihei Grand Prix! I recommend this game to all horse lovers! I love this game because you can be in contests and get other horses. I love how u can buy new horses and areas. Very nice game. Great graphics, fun things to do. It will preoccupy a lot of your time, and it is jut plain fun! I would highly recommend it! This game is soooo awesome. I love competing, grooming, and taking pics of my horses, which are named Candy, Lily, and Rainy. My Horse is the best! Good game. Friend me. my account is Simsopie. I have 6 horses. I am level 60, and my user is silvershinethepony(friend me);). However, there should be more kinds of competition like Western or Dressage. I love this game I play it all the time on my iPod. I have three horses: Beauty, Minuet, and Hijinx. I LOVE to go shopping! Normally I don't have any money or gems because I've shopped so much. ;) My name is SJCBug, friend me! I AM ADDICTED TO THIS GAME SO MUCH FUN! I HIGHLY RECOMMEND THIS GAME! I absolutely love this game it is sooo fun to play. I really like playing this game. It can get a bit boring if you don't buy gems but it's still really fun. I love this game! I play it on my Kindle all the time. I couldn't get many horses and I didn't get that many gems and money so it got quite boring after a while. i always play horse games, i am so pretty rich and beautiful. i have a 10 stories barbie house and 20 brand new barbie, everyone is jealous of me. i absolutely love this game i have soo many horses. THis is like my fave game on my ipad, i can share some tips if anyone wants me to! Do you need help playing this game? If you need help playing this game, share your question here. If you know how to play then please answer a question to help another girl figure it out! Share your review and tips for playing this game! Have you played My Horse, a tablet horse game? If so, please share your review and your tips for playing it here. We'd love to hear what you think!